You may not know this about the color of your ceiling, but over time, it will turn shades of yellow. Yellowing of the ceiling can be caused by sunlight, house moisture, candles, smoke, cooking oils and other everyday wear and tear. It’s one of those things that you never notice, since it is a gradual shift. Once you see it though, you won’t be able to ignore it. When you decide to paint your ceiling, you will be amazed how much brighter and whiter the entire room becomes. Most customers have our house painters paint the ceiling when we do the walls or trims so that everything looks new and fresh. The final result will have the room smelling and looking like new. Painting your ceiling yourself can seem like a daunting task; the last thing you want is to make a yellowed ceiling worse by making it look splotchy and sloppy. Not to mention that reaching the ceiling involves ladders and a fair bit of back arching and neck twisting. 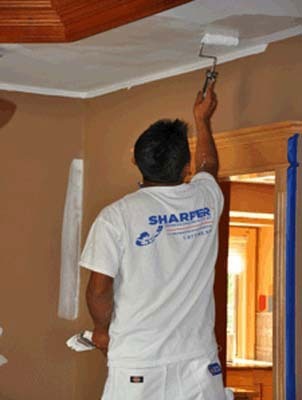 At Sharper Impressions, we eliminate that hard work by bringing in our professional ceiling painters who have perfected their craft. We have the knowledge and tools to paint your ceiling, no matter what type of texture it is. Our painters are also skilled at working around overhead fixtures, such as lighting or chandeliers. Looking for ceiling painting services to give your home a fresh look? Call Sharper Impressions Painting today to schedule a free estimate, or request a free quote by filling out the form below!